The OS X Menubar is that light-grey thing stuck to the upper edge of the screen. It’s stationary (with the exception for “fullscreen” modes) and thus is always visible. The Menubar is one of the core concepts of OS X’s UX which I really appreciate and which makes it hard to use OS’es which have one menu bar for each window. Anyhow, the thing is always there and it’s bright. So what? Computer screens follow the so called additive color mixing rules (technically “optical mixing”, but the concepts are the same) where adding more color and intensity creates a brighter color. Mixing all colors (reg, green and blue) with maximum intensity yields the color white while “not using any colors” yields the color black. What this means is basically that black on a computer screen is the most calm and low-intensity color while white is the most vibrant and intense color possible. From a purely logical perspective, computer software should be white text on dark background, but in reality that sort of mixture often induce a dull and “technical” feeling. Everything is in balance thus IMHO the key lies in not over-using white nor black. There are many more aspects to this discussion, like actual and perceived contrast when using different mixes of white/black or black/white, but we’ll save that for another day. It sits on top of the screen at all times and thus have little or no need to provide visual cues for where it is currently positioned or what it’s doing. It’s a peripheral user interface component – something you only place your eyes at when looking for some specific information, or call it a “passive area” if you will. 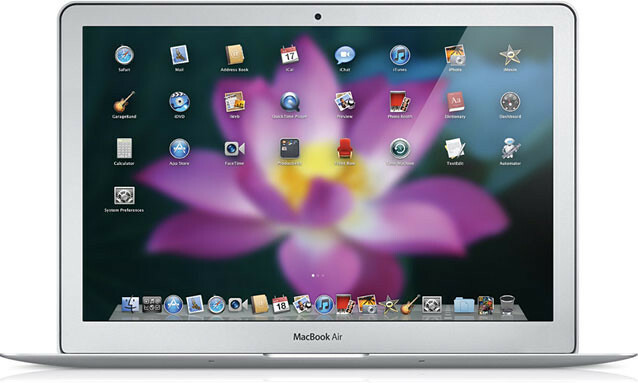 Three of its four edges border to black areas (the edges of modern Mac computer screens have a black glass finish), so there are few or negligible contrast issues with potential brightly colored neighboring areas. As I see it, there’s no sturdy logical or “concrete” argument for using a light-grey colored menubar except from a possible Apple user study suggesting many people like bright backgrounds. However, I doubt such a user study – if it was ever done – would be viable today and if one would be carried out today, how would you subtract the “background radiating influences” of most OS UI’s where backgrounds are usually white with black text? Focus on essentials rather than peripheral functionality. I believe the next version of OS X (10.7 aka “Lion”) will feature a black Menubar, or even no stationary Menubar at all but rather one that slides down when the mouse or finger comes close to the upper screen edge, almost like the Dock when hidden. 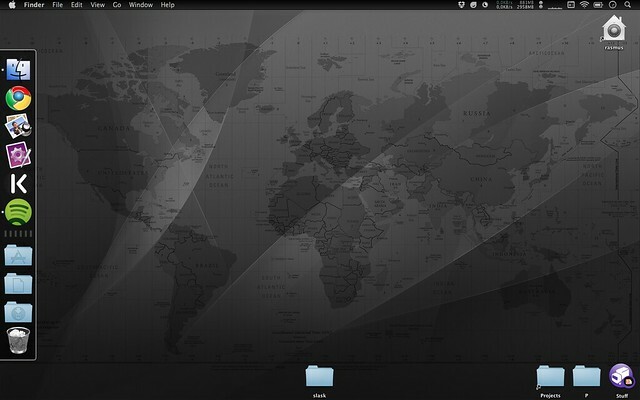 The wallpaper in the first screenshot can be found here: world-map-wallpaper.png. And here’s a special version which cancels the shadow and provides a blacker menubar: world-map-wallpaper-1440-black-top.psd. It’s a composite created by me but the sources are the OS X 10.5 standard wallpaper combined with a modified SVG world map w/ timezone info released in the public domain. I must admit that I actually did do some very light hacking of the Menubar; namely changing the fugly shiny dark apple with a plain black one so to achieve a clean “glyph-like” white one when using Nocturne. For this, I used ThemePark and simply created a new PNG in Photoshop which you can grab here: http://hunch.se/stuff/plain-black-apple-icon.psd (I release this little creation in the public domain). Icons on the right hand-side represent (from left-to-right): Nocturne, Dropbox, Droplr, MenuMeters and the rest are standard Apple stuff (character viewer, wifi, and so on). 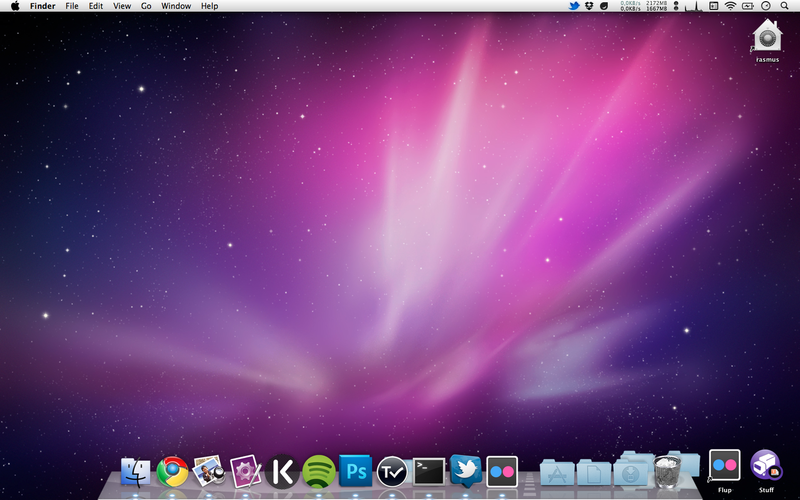 Contrary to what the first screenshot suggest, I keep my Dock hidden and use Spotlight for launching apps.